Clean a faucet aerator periodically to remove buildup. 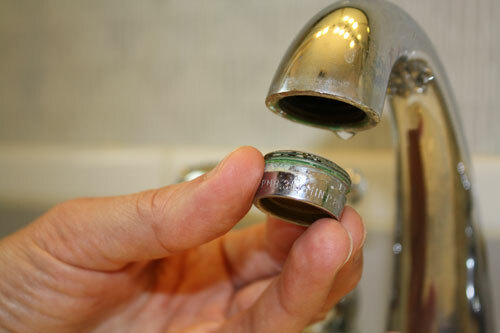 A clogged faucet aerator reduces water flow. Keeping an aerator clean also helps limit exposure to lead in water. Cleaning a faucet aerator is simple and quick. Many faucet aerators can easily be removed by hand. An aerator is an attachment that screws on the faucet tip. The device contains a fine-mesh screen. The screen cuts down on water use by mixing a little air into the water. The mesh filters out debris and gives water an even flow with fewer splashes. An aerator is not the same as a water filter. Most tap water contains minerals. These minerals leave deposits as water evaporates. You may have noticed deposits on fixtures, glasses or eating utensils. Water flow is reduced when minerals or other deposits fill the holes in the aerators screen. How Does a Clean Aerator Limit Lead Exposure? Pipes, solder or fixtures that contain lead can break down or leach into water. As water runs through the aerator, particles containing lead may lodge in the screen. Learn more ways to protect yourself from lead in water. How Can I tell If My Faucet Has An Aerator? Touch the end of the faucet. If you feel a screen, your faucet has an aerator. Faucets with an attached water filter don’t have aerators. Some faucets contain an aerator that’s embedded rather than attached. For these faucets, follow the manufacturer’s instructions for cleaning or disassemble the fixture to find the screen. How Often Should I Clean A Faucet Aerator? Clean them when get clogged. Some people recommend cleaning an aerator as often as once a week. Others may find a twice-yearly cleaning adequate. It’s a good idea to replace an aerator every year or so. They are cheap, and it’s just as easy to install a new one as it is to clean an old one. The housing, screen and mixer of this aerator show the effects of hard-water buildup. Place the rag in the sink to prevent small parts from falling down the drain. Use your fingers to twist off the aerator. If you need to use a wrench, wrap another rag around the faucet to protect if from scratches. Take the aerator apart, noting the order of assembly for later. 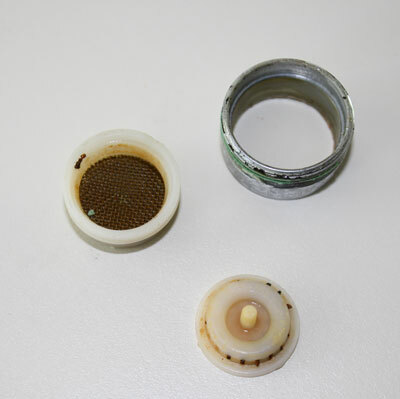 Your aerator may have several parts, including a housing, washer, screen or mixer. Place all parts in a container with vinegar. Soak for a about five minutes. Scrub the parts with an old toothbrush. Use a pin to poke through any remaining clogs in the screen or mixer. Put the pieces back together and screw the aerator on the faucet. If the aerator or washer is in bad shape, take it to a home improvement store and buy a new one. When you clean a faucet aerator periodically it improves the water quality and flow from your tap. If your water is brown or rust colored, there could be a problem with the pipes or other plumbing fixtures. Contact Simpson Plumbing for a plumbing inspection or pipe repair.